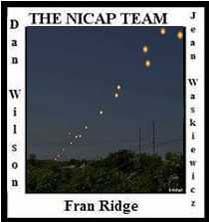 12:05 p.m. R. J. Maden, Steve Herrmann, and Karl Hermann observed a thin 3' circular bright disc hovering and fluttering in the air at an altitude of approximately 3,000 feet. The observers were at an estimated 2-3 miles from the object. It descended and rose through a vertical distance of 50 to 100 feet for some 5 seconds and while at the top of the ascent it suddenly swooped to the NE at tremendous speed and disappeared.